Before Beyoncé, Lady Gaga, Prince, Pearl Jam, and Armin van Buuren visited the backstage corridors, the dressing rooms, and the stage in the Ziggo Dome, there was... a cigar box and a dream. That was just the beginning. We would like to take you along on a journey through the past, the present, and perhaps even the future of the Ziggo Dome. From a window at the Amsterdam ArenA, two gentlemen, including the first employee of the Ziggo Dome, D. Damman, gazed over at the parking lot opposite the stadium. Consultations were held and an idea was born. In 2008, the first plans for a new concert location took shape on the back of a cigar box. A first sketch of a then nameless Ziggo Dome. The idea also arose elsewhere. The Black Box organisation in Delft had been playing with the same idea. At first, both parties came together but eventually decided to part ways and Black Box continued the project independently. In order to build a music venue with the best acoustics, partners needed to be found and a vision needed to be developed. Starting with a vision. The new location would be designed especially for live music. Good sight lines were needed for optimum enjoyment of the concert, perfect acoustics, comfortable chairs, and plenty of catering facilities. ‘Single purpose design, multi-use’ became the overall leading term. This concert venue should also be able to host other events where no concessions had to be made in the premises of the auditorium. Everything had to serve two audiences: the fan and the artist with his or her management. For these two groups, the keyword was: optimum experience. The concert venue had to breathe music. All 17.000 visitors would get the perfect live experience in the Music Dome – as the original name was at the time. “Inspired By Live Music” was the ultimate pay off. Live music always entails three elements: a supporting act, the main act, and an after party. Three phases in which the building and all its facilities would have to excel. Various partners were attracted. Partners for whom an ultimate experience is considered to be of paramount importance. The Amsterdam Music Dome became the Ziggo Dome. The slogans “Connected Forever” and “Inspired By Live Music” are by now intricately linked with each other. LG, Randstad, and Heineken also became business partners. La Place outlets were built, as were spacious bars, and a large number of toilets. Ziggo Dome makes it comfortable for you, the fans, and the artist. Not only the public areas were optimally furnished, the artist and production areas were taken into account as well. The building consists of six floors: basement, ground floor, and two tiers with seatings across four floors. The structure above the stage can carry a weight of 100 tonnes in equipment. Backstage are twenty dressing rooms from which the artist can see the illuminated LED facade. There is even a complete Legends Room where meet & greets can take place! It’s all about experience, before and behind the screens! The groundbreaking of the Ziggo Dome took place on 16 April. A memorable moment supported by a concert by Roel van Velzen who thus became the very first to give a Ziggo Dome concert! From building site to black box – the Ziggo Dome was taking shape. The most important USP was the acoustics. From the seats to the ceiling, the furnishing of the concert hall was designed with the best acoustics in mind. For example, the vertical parts of the tiers have 20 centimeter openings at each row where acoustic panel are placed. The upholstery of the seats originate from the automotive industry, the walls and the ceiling are provided with acoustic panel that absorb sound. It’s showtime on 24 June 2012! All service staff was ready, seating rows totalling five kilometres in length were waiting for the first visitors to take their seats. The two kilometres long beer pipeline and 450 meters of bar counters were ready for use. The 120.000 LEDs on the facade all around the Ziggo Dome brightly welcome the arriving fans. The Ziggo Dome was opened by Marco Borsato with his sold out Dichtbij concert. In the following days, Pearl Jam, Sting, Madonna, and Lady Gaga made their first appearances in the Ziggo Dome. In that summer of 2012, one newspaper headlined: ‘The Ziggo Dome; Las Vegas on the Amstel’. Yes, that is the Ziggo Dome. Bright lights, non-stop entertainment both in the building but also in the media and other channels. In the following years the greatest artists of the world have already made their appearances in the Ziggo Dome and more is yet to come! Every year, new bands and artists are on the rise and ready to captivate their audience. 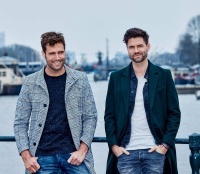 Undoubtedly they will want to claim their spot on the Ziggo Dome stage as well.